Recently I’ve noticed that television detectives’ detection skills have been replaced by technology. Between cell phones, email, tracking devices and the multitude of cameras that cover every nook and cranny of the earth, it’s nearly impossible for a modern TV criminal to operate in anonymity. This is a strange and drastic change from Dragnet days when phone dialing, ledger collation, footwork and thinking were involved in any arrest. What fascinates me is that, before modern techniques and technologies were created, police could catch criminals at all! In the novel The Yard author Alex Grecian portrays a squalid, horrifying London of 1890 where five-year-old children work dangerous jobs, living conditions for many are abysmal, and human life is held in little regard. Scotland Yard’s murder squad consists of 12 detectives who have roughly 400 murders per year to crack, and after the unsolved Jack the Ripper killings of 1888 public opinion of the police force’s skills is extremely low. Then the unthinkable occurs. A member of the murder squad, one of the men attempting to keep London safe, is brutally slaughtered. The team’s newest member is put in charge of the investigation, but there seems no hope in unearthing the crime’s perpetrator. Even after the Ripper murders, the idea of killing for pleasure is foreign to the detectives and they don’t know where to begin to find this new type of killer. But with the aid of Dr. Kingsley, the Yard’s first forensic pathologist (and somewhat of a Sherlockian figure) the squad makes slow progress, although the murders do continue. This is crime solving at its most basic – follow paltry clues, cogitate, and find a killer. These 1890’s were a time when it was relatively simple to be a successful murderer. Police had few tools-of-the-trade and criminals were able to easily disappear in obscurity. Here are a few titles that examine various aspects of the infancy of crime fighting. While examining the amazing feats that went into constructing the 1893 Chicago World’s Fair, Erik Larson also describes the activities of H.H. Holmes, a Chicago serial killer who used the draw of the World’s Fair to murder somewhere between 27 and 200 people in relative anonymity. In fact, it wasn’t until he left Chicago, continuing to commit homicides and other crimes, that Holmes was finally arrested in Boston a year later. His Chicago killings, however, remained unknown until the custodian of Holmes’s Chicago murder castle (you’ll have to read the book for those details) tipped off the police and Holmes’s murder victims were found. This true story shows how easy it was to operate as an invisible killer in the days before advanced technologies. This non-fiction account of an early 20th-century jewel heist details both the plans of the thieves and the methods used by Scotland Yard to catch them. In addition to being an engaging read, Crosby’s book highlights the importance of this case to the future of British crime fighting. This entertaining book looks at the careers of New York’s first medical examiner and toxicologist. Surprisingly, these positions didn’t even exist until after World War I. Blum makes a potentially dull topic intriguing and understandable. 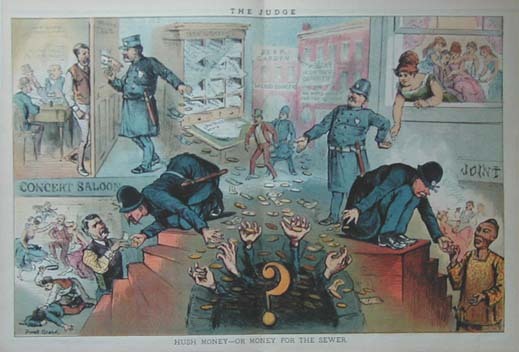 As police forces moved into the 20th-century, corruption came to be accepted as a normal facet of law enforcement. In 1935, during the dust bowl years, a spate of dairy robberies in the Spokane area resulted in the shooting death of Marshal George Conniff. Decades later, Sheriff Tony Bamonte of Pend Oreille County tried to shed light on the robberies and Conniff’s death. Author Timothy Egan paints a vivid picture of Spokane’s dirty underbelly and the role that law enforcement played in these crimes. This Oscar-winning movie portrays a shady LA police force that is rife with injustice and brutality. At a time when Hollywood was king, justice was elusive (put that on your movie poster!) and criminals often dwelt on both sides of the law. Certainly TV policing has little in common with reality, but then again, reality is far more interesting. So set aside your new-fangled DVDs and give an old-timey police investigatory book a try. At the very least, you’ll gain an appreciation for the accomplishments that were made with minimal means in less-than-hospitable conditions. This entry was posted in Fiction, Historical Fiction, History, Movies & Television, Mystery & Crime, Nonfiction, Northwest History and tagged crime, detectives, forensics, technology by Ron. Bookmark the permalink.